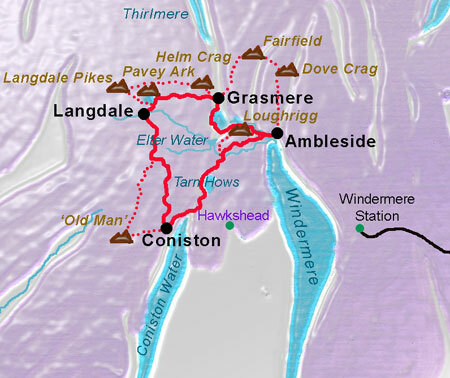 This four day circuit from Ambleside on Lake Windermere - England's longest lake, takes in the best of the South Lakes including Coniston with its 'Old Man', the spectacular Langdale Valley and Grasmere - the home of Wordsworth. Along the way you will walk through a landscape of dry-stone walls running impossibly up steep hills, tiny villages tucked into the folds of lofty peaks, quiet mountain tarns, and simply breathtaking views. We arrange comfortable accommodation in en-suite rooms at hotels and accredited guest houses on your route and we transfer your luggage so your bags are waiting for you when you arrive. 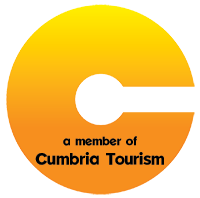 Arriving in Ambleside you check into your comfortable accommodation and can explore this interesting town, the capital of the South Lakes. There is a wide variety of restaurants, cafes, bars and pubs to choose from for your evening meal. From the hotel you walk through Ambleside to a bridge across the River Rothay which leads to the start of the path up Loughrigg Fell. Following this as far as Ivy Crag for superb views over Windermere, the path then traverses below the bulk of Loughrigg Fell before descending to Tarn Foot and on to Skelwith Bridge. The trail climbs past the waterfalls of Colwith Force and through the woods of Tarn Hows before a descent to the village of Coniston. 8½ miles. 1875 ft ascent / 1878 ft descent. Today's walk begins with a traverse of Loughrigg Fell. The climb to the summit at 1101 feet is delightful and the views in every direction are spectacular. From the northern end of the fell you have a particularly beautiful vista over Grasmere lake before dropping down to the Loughrigg Terrace and following the quiet road over the Red Bank to Loughrigg Tarn and thence to Skelwith Bridge. The final part of the journey passes through the woods of Tarn Hows before a descent to the village of Coniston. 10½ miles. 2643 ft ascent / 2646 ft descent. Today's easier walk option offers an insight to Coniston's industrial heritage passing through the relics of the old copper mines before following a trail high above the valley to Tilbethwaite Gill and into Little Langdale. A short stretch on the Wrynose Pass road leads to Hollin crag where a path leads past Blea Tarn and a final steep descent into the main Langdale Valley. 7½ miles. 2165 ft ascent / 2035 ft descent. You begin the day with an ascent of the Old Man of Coniston. A superb ridge line is then followed over the neighbouring tops of Swirl How and Great Carrs before descending to the Three Shire Stone on the lonely Wrynose Pass road. The road is followed briefly downhill with the stunning panorama of the Langdale Pikes ahead of you and a track then leads across the fern-covered hillside to Blea Tarn. Beyond the tarn the road is crossed again before the final descent into the Langdale Valley. 8½ miles. 3490 ft ascent / 3360 ft descent. The trail heads below the buttresses of Raven Crag before beginning a steep climb to the quintessential mountain lake of Stickle Tarn below the impressive cliffs of Pavey Ark where you have a sensational retrospective over the valley and to distant Windermere. The path now climbs gently to the wide top of Blea Rigg and then makes a steep descent to Easedale Tarn. Finally the outlet from the tarn is followed past the Sour Milk Waterfalls down to Goody Bridge and on to Grasmere, the home of Lakeland poetry. 5 miles. 1695 ft ascent / 1800 ft descent. A sensational mountain day begins with a steep ascent to Stickle Tarn below the brooding crags of Pavey Ark. From here you make the ascent of Harrison Stickle (2403 ft), the highest of the Langdale Pikes. From this lofty top the path strikes out north over Thunacar Knott (2351 ft) to High Raise (2500 ft). Now descending Greenup Edge, you cross to the head of Far Easedale before following a splendid ridge line over Calf Crag and Gibson Knott to reach Helm Crag above Grasmere. A final steep descent brings you to the door of your accommodation in the village. 8½ miles. 3125 ft ascent / 3230 ft descent. A highly scenic and pleasant option to finish the tour starts with a stiff climb following a quiet road out of Grasmere towards the Red Bank where you access the Loughrigg Terrace, a wonderful 'green way' which passes high above Grasmere lake and then past Rydal Water. A detour to the massive cave at Loughrigg quarries is well worth the effort and a final stroll beside the River Rothay brings you back to Ambleside. Overnight in Ambleside. 5 miles. 650 ft ascent / 700 ft descent. A fitting climax to this Central Lakes trek is this traverse of the ridges of the Fairfield group beginning with an ascent of Fairfield (2863 ft) itself and then over Hart Crag (2698 ft) to Dove Crag (2603 ft) and finishing with a superb decent over High Pike and Low Pike on one of Lakeland's finest ridges which ends right in the heart of Ambleside. Overnight in Ambleside. 8½ miles. 3125 ft ascent / 3175 ft descent. Let us know if you require a transfer to Windermere station and we will arrange this for you (at extra cost). The nearest railway station is at Windermere. From Windermere there are taxis and a regular bus service to Ambleside - a journey of 5 miles. Alternatively, if you are arriving by car we can arrange parking in Ambleside (possible extra charge).